NOAA Administrator Jane Lubchenco announced today that she will step down in February, ending a four-year tenure that saw the longtime academic juggle a slate of controversial issues, from the Gulf of Mexico oil spill to the skyrocketing cost of weather satellites. In an email to employees this morning, Lubchenco wrote that she was leaving the National Oceanic and Atmospheric Administration to return to her family and academic career in Oregon. "As many of you know, my home and family are on the West Coast. I'm deeply grateful for the support and love of my family, but as wonderful as Skype is for staying in touch, it is not a viable long-term arrangement!" she wrote. 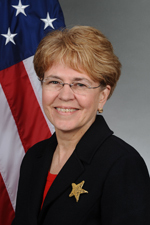 Lubchenco became the first woman to lead NOAA in 2009, after President Obama nominated her to much acclaim from environmental groups and oceans advocates. The confirmation of Lubchenco, a marine biologist, also represented a shift for an agency whose previous two leaders had backgrounds in oceanography. In her email, Lubchenco highlighted 20 "top achievements" during her time at the agency, including "ending over-fishing," strengthening the nation's environmental satellite infrastructure and creating the first National Ocean Policy. "We've tackled some big challenges together," she wrote. "Through an emphasis on transparency, integrity, innovation, team work and communication, we have made significant progress on multiple fronts. As you know, NOAA's breadth is one of our greatest challenges, but it's also our great strength." Names of several possible replacements have been bandied about among ocean experts who track NOAA issues, including Terry Garcia, Frances Ullmer and Andrew Rosenberg. Garcia, a lawyer, is a former NOAA official who is currently a vice president at the National Geographic Society. He and Ullmer, former lieutenant governor of Alaska, both served on the administration's national commission to investigate the BP Deepwater Horizon oil spill. Rosenberg, a scientist, was head of the fisheries service under the Clinton administration and served on the U.S. Commission on Ocean Policy and the National Academy of Sciences Ocean Studies Board. He was recently named chief scientist at Conservation International. But the NOAA post could go unfilled for some time, as the administration will have to first appoint and confirm a secretary of Commerce. That post has remained empty since John Bryson resigned in June, due to health problems and a related hit-and-run crash he was involved with in California. As news spread of Lubchenco's exit, environmentalists praised her tenure as one marked by a focus on science. Janis Searles Jones, the interim president of the Ocean Conservancy, credited Lubchenco with leading a "forward-looking agency determined to preserve the ocean for generations to come." "Ever a teacher, Dr. Lubchenco has been one of the most steadfast champions of science and the need for scientists to become solutions- oriented at a time when restoring scientific integrity is an urgent priority for the country," Jones said in a statement. "Under her leadership, NOAA renewed its focus on key ocean issues like ending overfishing, reducing marine debris, protecting the Arctic and tackling climate change and ocean acidification." But Lubchenco's tenure has not been without controversy. In 2010, Massachusetts Democrats Barney Frank and John Tierney called for Lubchenco's resignation after an inspector general's report found NOAA's law enforcement officials used penalties collected from fishermen to buy cars and boats, go to international conferences and fund covert activities with little budget oversight. Frank later backed down from what he called too drastic a demand (Greenwire, July 12, 2010). Fishermen frustrated with new catch limits have also blamed Lubchenco, who they perceived as in league with environmentalists. Hundreds of fishermen gathered in Washington, D.C., at two protests during her tenure. More recently, Lubchenco faced questions from lawmakers on financial mismanagement at the National Weather Service. An internal investigation found that NWS officials had reallocated tens of millions of dollars without required congressional approval, prompting NWS Director Jack Hayes to retire. The cause is still unclear, and several investigations are under way (Greenwire, Oct. 18). Lubchenco has also had to deal with funding shortfalls for the Joint Polar Satellite System, which collects the bulk of data used to make weather forecasts and issue hurricane and tornado warnings. Lawmakers have cringed at the cost of the $12.9 billion effort, while Lubchenco has stressed the need to make up for past funding shortfalls that are expected to lead to a substantial gap in data collection.